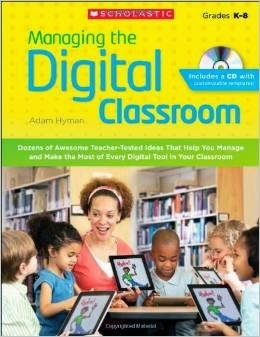 I recently purchased a fantastic resource: Managing the Digital Classroom. Here is the link to purchase it from amazon.com. I have been using technology in the classroom for a number of years now. I was among the first in my school to get a SmartBoard (I just happened to have a meeting with our director the day she met with the SmartBoard company). I have always been a huge advocate for using technology whenever possible, not only because it can and does make life easier, but because technology tools are how you grab the attention of our students today. Rather than simply reading as fast as possible, I'm going to take my time and reflect over the chapters. I'll review a chapter each week, much like a book study. If you would like, you are more than welcome to join me. I'd love some feedback and to throw some ideas around with other people! Has anyone else read this? This is fantastic that you have my book on your blog - hope you liked it and found it helpful!